Voting is now underway in the 2013/14 Pro Hockey NIHL North Moralee Conference Awards (in association with the EIHA). The main categories in this year’s awards are Player of the Year, Coach of the Year and Young Player of the Year while votes are also being cast on an All Star Team for the division. Each club in the Moralee Conference can cast up to 8 sets of votes with players, coaching staff, management and journalists associated with NIHL North all eligible to vote. All NIHL North sides have taken interest in this year’s Awards and it is hoped that every club casts a number of votes as all eligible clubs did last season. There will be a new NIHL North player of the season this year as last campaigns winner Nathan Salem is now playing in the English Premier League with the Telford Titans are therefore no longer eligible. Free scoring forwards such as Adam Brittle (Blackburn Hawks), Chris Sykes (Sutton Sting), Adam Reynolds (Whitley Warriors) and Lukas Zeman (Manchester Minotuars) are sure to be considered while top defenceman such as Juraj Senko (Solway Sharks) and Andrew Munroe (Billingham Stars) will more than likely also be in the running. 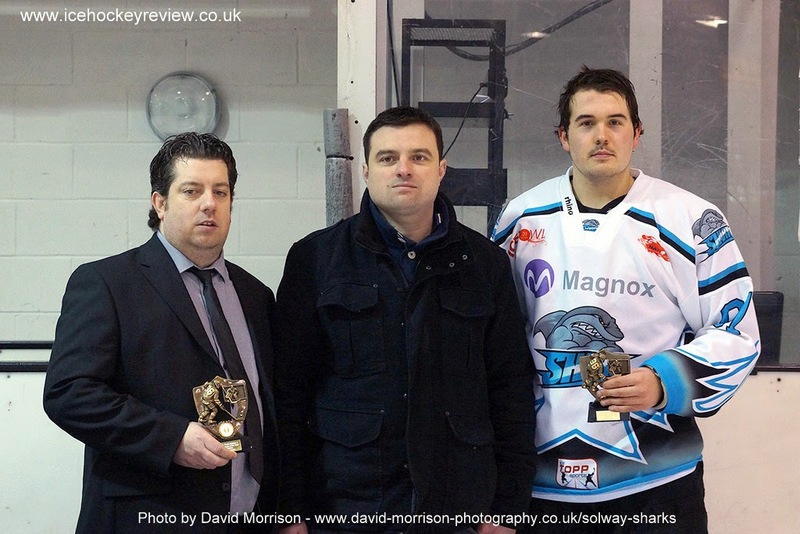 There are also many candidates to take the Coach of the Year title with last year’s winner Martin Grubb of Conference Champions the Solway Sharks one possible choice however Jared Owen (Blackburn Hawks) is bound to be of interest given how well his side have played this term. Martin White of the Sheffield Spartans could also be under consideration by many given his clubs stellar showings over the course of the campaign. The Young Player of the Year is a newly introduced Award this season and voting in this sector looks to be highly contested with a great number of hugely promising youngsters in the division at present. A number of young forward such as Ben Richards (Whitley Bay) Connor Henderson (Solway Sharks) and Macaulay Heywood (Telford Titans) are all likely to receive some support while up and coming blue liners like Jonathan Kirk and Alex Harding of the Sheffield Spartans will also be of interest to those casting votes. Voting will hopefully be completed in the next week or so and the winners of the NIHL North Awards will be announced at the Moralee Conference Play Off weekend that takes place at Solway Sharks Dumfries Ice Bowl over the weekend of the 12th/13th April. The actual presentation will take place on Saturday evening following the conclusion of the 2nd semi final match up in the cafe that overlooks the rink. Fans will get the opportunity to mix with the players and management of all the NIHL North sides in attendance while a buffet will also be served.